On Scene: 3D Insert Hats go beyond the Firehouse…take them out to the ballgame! 3D Insert Hats go beyond the Firehouse…take them out to the ballgame! Any Baseball Fans out there? Spring training games have begun! If you're anything like me, that's got you pretty excited. You've seen our 3D insert hats and based upon the response, you pretty much love them. They certainly make an awesome hat for the Firehouse, but have you considered dedicating one to your favorite athlete or team? I'm a Phillies fan and I've rooted for Utley since he was in the minors (yeah, I know, if you aren't a Phillies fan, you probably hate Chase...I get it), so I had an Utley hat made in Phillies team colors. No reason you couldn't do the same for your favorite player as well. We've got plenty of hat, patch, and thread colors to choose from to match up to your favorite team. Just put the player's number on the front and drop their last name or nickname on the back of the hat. Yankees - A little Jeter love? How about your newest pitching addition Michael Pineda? Red Sox - Can't go wrong with Ellsbury, Adrian, or Dustin. Rays - Longoria? Price? Top Pitching Prospect Matt Moore? Orioles - Markakis, Jones, or Weiters? Blue Jays - Jose "The HR King" Bautista or Brett Lawrie. White Sox - Could be a rough year...hearken back to better times with a throwback Frank Thomas hat. Twins - Mauer. End of story. Tigers -The Prince could bring a story book ending to Detroit's season. Plenty of other stars to choose from too. Royals - The future is bright with young studs like Hosmer, Moustakas, Duffy, and Bubba Starling. Angels - PUJOLS. The shot heard round the world this off-season. Athletics - Well, you're used to it by now. Develop a young player and then trade them away. I'd suggest Jarrod Parker, Michael Taylor, Jemile Weeks, or go with current ESPN coverboy Brandon McCarthy. Or somewhere around mid-season you'll have Manny Ramirez goofing off in Left Field...just Manny being Manny...so he's a possibility. Rangers - Yu Darvish - the biggest Japanese signing since Ichiro! Josh Hamilton is a great choice as well. Mariners - Can't go wrong with Ichiro or Felix...but if you like rookies, why not Jesus "The Savior" Montero or Dustin Ackley? Braves - Chipper IS the franchise, but the future is still looking good with Heyward, Hanson, Freeman. Or go with my personal fave and future Ace Julio Teheran. 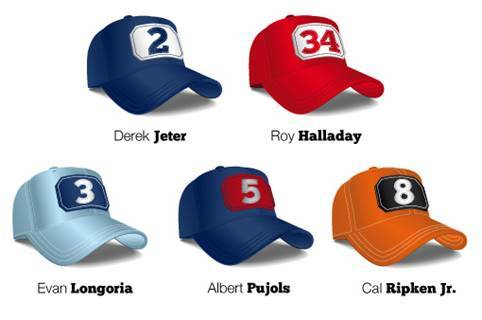 Phillies -How about a different hat for each ace? Hallady, Hamels, Lee or you can copy me with an Utley or better yet Hunter "Let's go Eat!" Pence. Nationals -The future is now for the Nats - Strasburg and Harper...you can't go wrong. Marlins - New stadium, new colors, new players. Perfect time for a Jose Reyes hat...or that crazy cat LoMo. Reds - Votto or The Bruce. Pirates - Which prospect will pan out? My money is on Andrew McCutchen. Cardinals - If the Rally Squirrel had a number, I'd suggest that. Since he doesn't, why not World Series and Local Hero David Freese? Cubs - New faces in the front office and on the field. Starlin Castro is legit. Anthony Rizzo is Next. Astros - The minors should be fun to watch. Maybe a throwback Nolan Ryan or Jeff Bagwell is best. Brewers - With Braun exonerated he seems like the player of choice, but lots of young talent on that team. Diamondbacks - Justin Upton? Ian Kennedy? Anyone from a loaded minor league system. Rockies - Cargo or Helton seem the obvious choices. Dodgers - Kershaw or Kemp...can't go wrong. Padres - Cam Maybin will have a break out year. Yonder Alonso will become a fan favorite too. Giants - The usual suspects here: Lincecum, Cain, or The Beard. To get started building your hat, click here. Then add a hat to the cart and you'll be prompted through the embroidery process. I'd suggest leaving off the inside the number stitches to give a puffier look, but do what you think will look the best. What color combos would YOU choose?